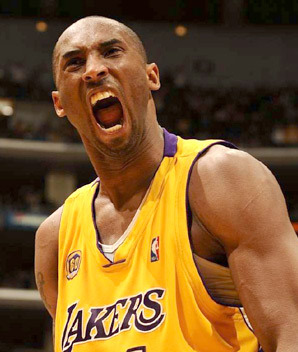 The J Spot: Kobe Bryant Homophobic? Kobe Bryant is being hit with a $100,000 fine for making a homophobic slur. Is this right? I don't like the guy, I really don't. But when I heard about this big of a fine being imposed I almost had sympathy for him. Then I watched the video. I don't know if Kobe is homophobic or not. I do not believe the slur used in this instance was being used in a homophobic manner. I think he was angry (he does have a short temper)and I think he resorted to inappropriate words to act out his anger. Should he be fined this large amount for his short fuse? Absolutely. Everybody knows that words have power and actions have consequences. What Kobe did (if ignored by the NBA) would have sent out the message that its okay to use this word in times of anger. And the bottom line is this - its never okay to use this word. It's also a weird issue of timing for the NBA. As the video below points out, this happens on the same day that that the league is trying to create the message that the NBA is a "gay friendly" place. If they had not taken action against Kobe, the video done by Grant Hill would have been made in vain. So Kobe - watch your mouth. And know that when your act out, get angry, or go unchecked, there will be consequences and repurcussions. And at this moment the consequence is $100,000 out of your pocket. Dear Mama . . .